Admittedly, I was uninspired when I first peered into the vegetable crisper. I’m a fan of both, but this was the first time to combine them in one dish. The emphasis being, one dish. We were grilling steaks and I wasn’t in the mood for much fuss. Matt had already opened the wine, so it took a little coaxing to convince me we needed more than rib eyes and vino. If you’ve been around Savoring Today for any length of time, you are surely aware of my affinity for goat cheese. And fried goat cheese? Well, in my opinion, fried goat cheese is pretty much the rainmaker of garnishes. In this irresistible side dish, it brings together an odd couple beautifully and deliciously. Goat cheese to the rescue. Well, rescue might be a strong word, but it did bring the element of inspiration I lacked. It also surprised me how well the sweet, earthy beets balanced the assertive flavor of asparagus. The fried goat cheese brings salt, tang, and texture that makes you forget how healthy it all is. The photo shows only one golden disc of cheese, but I actually served it with two so we each had our own. For those less gaga over fried goat cheese, figure one pad of cheese for every two people. When served, it is easy enough to scoop some of the cheese with each portion. There are a couple of steps you can do in advance, like coating the cheese and simmering the beets until tender (this can even be done the day before). Once the steak (or any grilled or roasted meat) is done, the beets and asparagus will grill-up in about 6 minutes while you fry the goat cheese. Of course, you can roast the beets and asparagus if you don’t have a grill and it will be just as tasty. 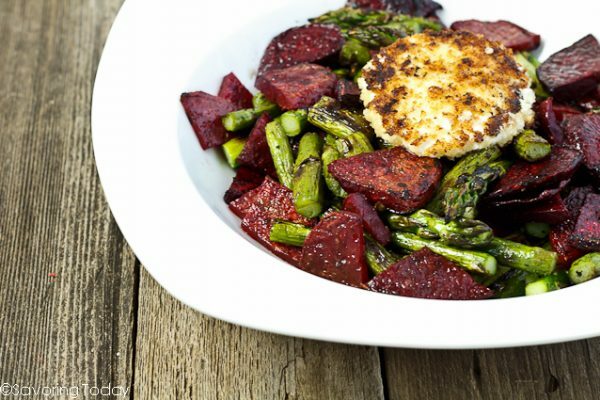 An easy and flavor packed side dish made with Grilled Beets, Asparagus and Fried Goat Cheese. Serve this side with steak or your favorite main. Place peeled and sliced beets in a saucepan with salt and cover with water. Bring to a boil then reduce heat to medium and simmer until beets are fork tender, about 15 min. Drain beets and toss with oil. Arrange asparagus on a rimmed baking sheet, drizzle with oil and roll to coat. Season with salt and pepper. 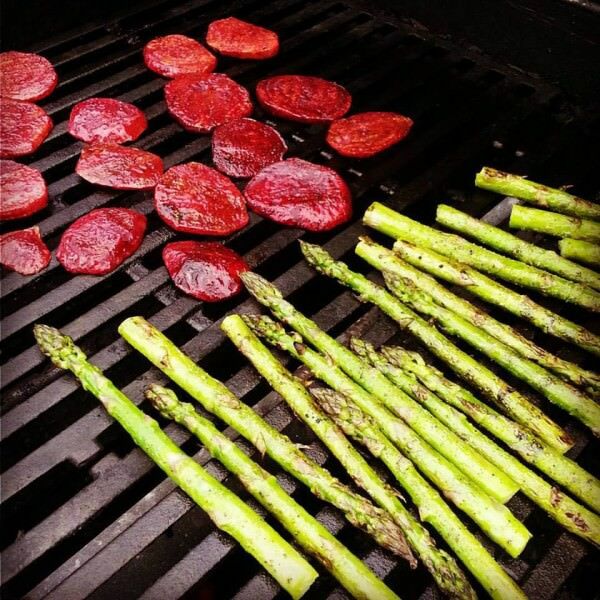 Place beets and asparagus directly on the grill grates and grill over high heat until vegetables are lightly charred in spots, 3 to 4 minutes on eat side. Remove from grill, cut beet slices into quarters and asparagus into 1-inch segments. Toss together in a bowl, cover to keep warm, and set aside. If needed, keep warm in the oven until ready to top with the goat cheese and balsamic. Cut or shape goat cheese into a 1-inch by 2-inch thick diameter disc. Press goat cheese into panko crumbs on all sides. Heat 2 to 3 tablespoons of oil a cast iron skillet over medium heat. When the skillet is hot, place the discs of goat cheese in the skillet and cook until golden brown on both sides (about 2 minutes on each side). Place fried cheese on top of the vegetables. Drizzle with balsamic and serve immediately. Beets and asparagus can be oven roasted at 400°F for 8-10 minutes as an alternative to grilling. To make this gluten-free, use gluten-free panko crumbs for the cheese. I adore the contrast of these two. 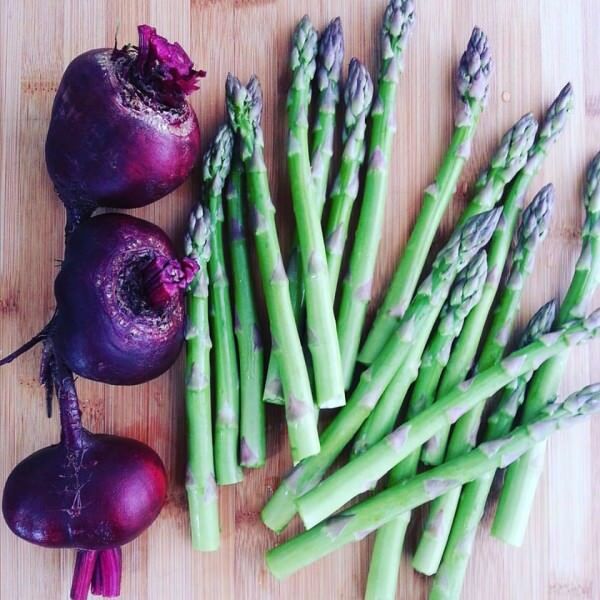 Color, size, shape … even the light purple hue of the asparagus that complements the jewel toned beets. New favorite pair. Because Man does not live by steak alone. Grilled beets…now that’s a new one. This salad looks awesome! I can almost smell that vegetables cooking on the grill and the feta idea sounds wonderful! I’ve roasted beets plenty of times but never grilled them. And never fried goat cheese! Two terrific ideas, and one awesome looking recipe. This is wonderful — thanks so much. Grilled beets have always been a favourite of mine. 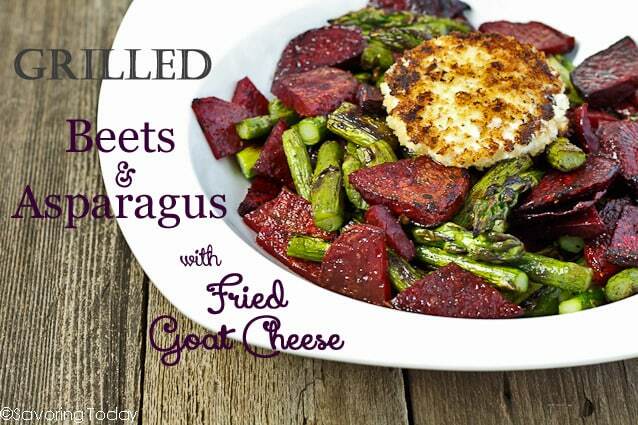 Love the fried goat cheese you serve them with! I have never fried goats cheese before and I don’t know if I can wait to put shoes on to get to the store to get some to try this dish. I LOVE roasted beets and this dish gives me everything. Brilliant!